«©NCSX» Sega and Tri-Ace team up to create an RPG where the populace of the planet resides inside a massive tower named Basel (not Babel) that was built ages ago. Inside the tower, a lad named Zephyr and his pony-tailed friend Vashyron work for a security firm which keeps the peace. The third member of their party is a girl named Reanbell and all three are handy with firearms. When a problem inside the tower causes the purification system to go wonky, the social situation inside Basel begins to get uncomfortable. The opening cinema shows Zephyr swinging like Tarzan to save a girl named Experiment-20 from certain death. She has leapt from an overhead platform and he catches her in mid-plummet but as he zooms through the air with live cargo in tow, the rope breaks and the two drop downwards. Holding hands, they pass a massive clock and utter a few words to each other without any sense of fear. Eventually, they spread their arms and float downwards like skydivers except neither of them owns a parachute. Once the proper game starts, movement on the world of Basel is handled by shuttling the party's icon over grid-laced environments. When an encounter starts, bullets hit the screen (which breaks) and the battle phase begins where Zephyr's party is arrayed against enemy forces. Every attack is a stylized, gravity-defying ballet where Zephyr and friends showboat their gun-slinging skills by posing in odd contortions while shooting from a range of angles. 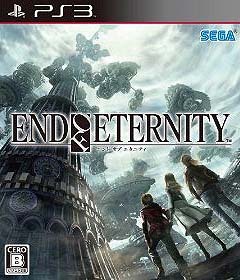 Early preorders for EoE will ship with a bonus End of Eternity Soundtrack titled "Resonance of Sounds" which is being given away by Sega in 50% ratio.